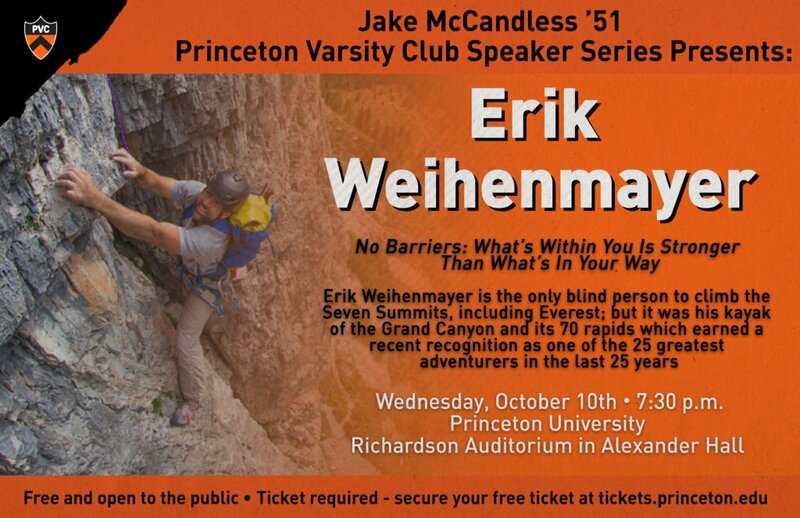 The Princeton Varsity Club is excited to welcome Erik Weihenmayer to campus on Wednesday, October 10th as part of this year’s Jake McCandless ’51 PVC Speaker Series. Erik is truly an inspiring person whose accomplishments are vast, including being the only blind person to climb the Seven Summits and earning recent recognition as one of the 25 greatest adventurers in the last 25 years after kayaking the Grand Canyon and its 70 rapids. Wednesday, October 10th, 7:30 p.m. NOTE: We will promote the evening program to student-athlete directly, but appreciate your assistance in sharing the event and encouraging attendance. Erik is a world-renowned speaker and has a powerful message to share. We encourage all teams to attend as schedules permit. Tickets can be secured online, or in person at the Frist Campus Center. The PVC also has a small printed allotment available in the PVC offices.